I often share this story because it is a reminder that what might seem like an extraordinary occurrence—spiritual awakening—is a built-in human capacity. Siddhartha Gautama (the Buddha’s birth name) was a human being, not a deity. When Buddhists take refuge in the historical Buddha, whose name literally means “one who is awake,” they are drawing on the inspiration of a fellow human who was able to realize his inner freedom. Like us, Siddhartha experienced bodily pain and disease, and, like us, he encountered inner distress and conflict. For those who follow the Buddha, reflecting on his courageous investigation of reality, and his awakening to a timeless and compassionate presence, brings confidence that this same potential lies within each of us. In a similar way we might reflect on Jesus or on teachers and healers from other traditions. Any spiritually mature, openhearted human being helps us trust that we too can awaken. You may have already touched upon this outer refuge with a caring and wise teacher or mentor. An African American friend who leads corporate diversity trainings found refuge and inspiration in his minister, a leader in the civil rights movement and an exemplar of generosity, humor, and wisdom. I found refuge in my first meditation teacher, Stephen: His great love of meditating, and his own unfolding clarity and kindness, helped awaken my devotion to the spiritual path. About ten years ago I began experimenting with a simple self-guided meditation. I would call on the presence of the divine mother (the sacred feminine) and over the next minute or so, I would begin to sense a radiant openness surrounding me. As I imagined the mind of this awakened being, I could sense vastness and lucidity. Then, as I imagined the heart of the divine mother, that openness filled with warmth and sensitivity. Finally, I’d direct my attention inward, to see how that tender, radiant, all-inclusive awareness was living inside me. I’d feel my body, heart, and mind light up as if the sunlit sky was suffusing every cell of my body and shining through the spaces between the cells. I’ve come to see that through this meditation, I was exploring the movement from outer refuge to inner refuge. 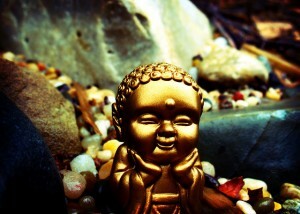 By regularly contacting these facets of sacred presence within me, I was deepening my faith in my own essential being. Realizing who we are fulfills our human potential. We intuit that we are more mysterious and vast than the small self we experience through our stories and changing emotions. As we learn to attend directly to our own awareness, we discover the timeless and wakeful space of our true nature. This is the great gift of following a spiritual path: coming to trust that you can find a way to the true refuge of your own loving awareness, your own perfect Buddha nature. You realize that you can start right where you are, in the midst of your life, and find peace in any circumstance. Even at those moments when the ground shakes terribly beneath you—when there’s a loss that will alter your life forever—you can still trust that you will find your way home. This is possible because you’ve touched the timeless love and awareness that are intrinsic to who you already are.